Congratulations to Cherri-Anne Boitson of Canada, winner of the $50 ThinkGeek.com gift card in the Zeus Is Dead Launch Celebration Bonus offer! 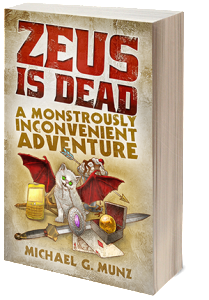 Cherri-Anne purchased Zeus Is Dead: A Monstrously Inconvenient Adventure on Amazon and then forwarded her receipt to get bonus content and a chance to win the gift card. She was selected as the winner yesterday. A runner-up reader received the 2nd place prize of an official Zeus Is Dead poker deck, and several eligible others received Zeus Is Dead bookmarks. Thanks to everyone who made the book’s launch week a success! Just heard about Zeus Is Dead? The bonus offer has ended, but you can still grab the book on Amazon, Barnes & Noble, iTunes, and elsewhere, in paperback & ebook formats!